2015 update: This October my husband and I were at Panera, it was a cool day, perfect for soup, so I thought I would give it another try, I think they’ve been through many variations since I last posted… it was good! It was nothing like what is pictured above. It was delicious!! I mentioned to you on an earlier post about Panera changing their chicken noodle soup recipe… ugh, disappointing. I’m all for change, but only for the better. Let me know what you think! Do you like the new soup? If so I will be quiet, hee hee. Actually, I don’t want to appear crazed, so this is the last Panera Post, but wanted to get the word out! I am a fan of your chicken noodle soup with the noodles that taste so homemade! Today I ordered my usual chicken noodle soup and received a cup as well as a small serving in a to-go container. I opened it up and tasted it because it looked different. IT WAS AWFUL. It had a horrible aftertaste. PLEASE tell me that you aren’t changing the recipe to what I had sampled today… I know I won’t be the only one who isn’t pleased… I had my husband taste it and he said it tasted like a cheap version of Campbell’s. Truly, it wasn’t even that good. Sincerely, a big fan of your chicken noodle with the homemade noodles! Thank you for taking the time to contact Panera Bread. We are always trying to improve our menu and to keep it fresh and inviting. Our new All-Natural Low Fat Chicken Noodle Soup is a more contemporary and wholesome recipe. It’s an all-natural soup made with chunks of all-white chicken, firm fresh vegetables and traditional egg noodles in a light and flavorful broth. Although we are disappointed to hear that you do not enjoy this new addition to our menu, we certainly appreciate the feedback. I will be sure to note your comments for review by our Product Development Department. Again, thank you for contacting us. We appreciate your business and value your comments. omgosh! i just tried the low-fat chicken noodle soup not realizing that it was recently changed, and i thought from just looking at it that something was off. It looked think and not thick. When i first tasted it, i thought i had been given a totally different soup. It was then that i saw a sign that it had been changed to low-fat chicken noodle soup. Good-bye are the days where Panera’s chicken noodle soup was thick, flavorful and hearty. Caroline, if you get a chance contact Panera and let them know how you feel… Maybe we can get the good soup back OR at least a tasty alternative! Thanks for your comment! I totally agree!! I just sent Panera an email about how watery and icky the soup is now. Thanks for contacting Panera, the more the merrier… I hope! Agree… the “new” version is a horrible broth, no substance whatsoever… pass on the email to anyone you know who feels the same way! Thanks Elise! Okay, I just had this soup today, and I was VERY disappointed. Why did they mess with such a great soup? I did a search online to figure out whether it was just our branch or a chainwide change and found your blog. Thanks for the info — I sent them an email, too. Carrie, great that you contacted Panera, they won’t know we’re disappointed unless we tell them! Appreciate the comment! Paneras chicken noodle soup used to be the best soup in the world! And now it sucksss!! Why did they change it??? they changed the soup cause it had too many preservatives i mean really? i hear ya! “Heavy sigh”… are the only words I can come up with! My wife and I just found out about the change today. We also do not care for it, noodles to thin and the broth is also too thin. We will be sending our concerns to Panera also. Great, thanks Dave! It surprises me that they think this would be an improvement, and I’m not sure if they will switch back, but it can’t hurt to let them know how we feel!! Before I found your posting…I also sent a message to Panera’s. I’m soooooo disappointed. I really hope others reach out to them also. They definitely lost me as a customer. Can anyone find the old recipe anywhere online. I can only find the NEW recipe with is CRAP! Thanks! Kelly, so glad to hear that you contacted Panera, it’s the only way they’ll know we’re unhappy. Ick, I wouldn’t want the new recipe either… If I can find the old recipe I will definitely post it! Thanks for your comment! I feel exactly the same way. I was so upset to see what they replaced my favorite soup with. I googled it to see what made the soup thick and found your blog. This was my letter to them. I love(d) your old Low Fat Chicken Noodle soup. My husband and I went to Panera at least once a week. The staff knows us well. We even celebrated our anniversary there. I have stomach issues and I tolorated the soup well plus it was delicious. When I first tried the new soup I did not like it at all and was so upset to find my old favorite was discontinued. I loved the big homemade tasting noodles, the slight thickness the size of the celery even. I may be wrong but it seems smaller and today when my daughter brought home the soup and sandwiches for a treat my chicken noodle (?) soup was mostly broth. I thought I would get use to it but I’m not neither is my husband. I guess we’ll try the Starbucks up the street or maybe the dinner in the next town to be our special place. Thank you for bringing some attention to this. I just went to lunch there today and couldn’t believe my eyes. I also saw a woman at the next table look at hers with disgust and say something to the server. It has to be one of their best-sellers for it to be on the menu everyday – why on Earth would they change it so drastically, and to something so yucky??? I shared my feelings on their website as well. Hopefully we can all get the word out! Great job Stacey! Ugh, that was exactly how I felt… Not all soups are served everyday, so if it is you would think they wouldn’t change it… Ahhhh! I wanted to touch base with you because I found a more than suitable replacement! I know it’s not technically “soup season” anymore, but here in Nebraska, we’re having a bit of a cold spell right now. I hope you have a Boston Market where you live. Their chicken noodle soup is delicious! Big thick noodles, lots of huge chunks of chicken, celery, carrots and onions with the perfect amount of seasoning. You get a HUGE bowl, and it’s less expensive than Panera. I haven’t been back since the change, but happily found something to take its place. Happy hunting! Hey Stacey, so glad you found a great substitute for the Panera chicken noodle!! Hear that everyone??!! If you have a Boston Market give it a shot! Unfortunately we don’t have one in Charleston, luckily the season is heating up (85), so cold cucumber soup sounds good now (for those of you in Charleston, SC you can’t beat Fast & French (AKA G&M) for their cold cucumber soup!! Thanks for the hot tip Stacey!! While traveling I’ll keep my eye out for a Boston Market so I can give it a try! After suffering a slightly embarrassing bout of consumer outrage when trying the new soup, I googled and found this. I sent an email to Panera as well – I hope we can make a bit of a difference! (though it’s doubtful) Thanks for writing this. 🙂 I don’t think I’ll go to Panera again, even though I ate lunch there every workday for about five years – the only thing I ate regularly was the chicken soup! Had the soup this morning and was completely disappointed by it. At first I thought the kitchen made a mistake but then I searched online and found your blog. Already sent my opinion to Panera, and I’m hoping that maybe, just maybe, they will bring the old recipe back. Much thanks for writing about this. Hey Pete! I agree, when you order the chicken noodle soup and receive chicken “noodle” “broth” it certainly seems like a mistake! I too am hoping they bring the old back, I’m glad to hear that you let Panera know how you feel! Thanks for commenting! I just came back from Panara, I like the people there too much to leave altogether. When ordering she asked if I wanted soup and I told her “no” and that I hated the new soup and she said everyone does! I was surprised to hear her say that there. After I called I wrote, I never recieved a reply. I think we should put it in writing..like writing an actual letter to the company. What about starting a petition? There must be more people that feel the same. This isn’t a duplicate note..I just came back from Panara, I like the people there too much to leave altogether. When ordering she asked if I wanted soup and I told her “no” and that I hated the new soup and she said everyone does! I was surprised to hear her say that there. After I called I wrote, I never recieved a reply. I think we should put it in writing..like writing an actual letter to the company. What about starting a petition? There must be more people that feel the same. Judy, I know it took quite a while before I received a reply from Panera, they said they were overwhelmed with questions about MY PANERA card. I really do think they will reply to you, be patient… If you haven’t heard anything in a few weeks, give their office a call, I’m sure they want to hear feedback from their good customers! I always try to make a habit of speaking to someone (in customer service especially) as I would like to be spoken to, you get a better response! Good luck and keep us posted! Thank you Barbara, yes, I understand..I would never be rude. It isn’t their fault, it’s the decision of the people in charge. The person I spoke with when I called was very nice, I just posted so you would know that the lady at Panara said they were getting a lot of complaints as hope. Hope that they may consider a change back. I won’t post again until I hear back. Hey Judy, thanks so much for the update! I did (gasp) stop in Panera this weekend for a salad, I asked the girl how the new chicken noodle soup was going over. She said that half the people liked it and half the people didn’t. I could tell that she couldn’t really say what she wanted to… the last time I asked I was told the same thing as you, that THEY weren’t happy about it, they didn’t think it tasted good at all, and they knew the customers wouldn’t be happy about it (this was about a week before the switch when they were passing out samples), but that it was a corporate decision and out of their hands. So THANK YOU for the feedback! We look forward to hearing back from you! Hi Judy, I’m glad to see it’s not just me that cannot stand Panera’s new chicken noodle soup. I have/had a standing date every Wednesday with a friend at Panera for over a year & the only menu item I order is the chicken noodle soup. Twice they gave me the sample of the new soup – YUCK!!! It tastes like canned soup – which I can buy much cheaper. One of the employees told me it reminded her of Progresso. I wrote a note to Panera and received the exact same response as you (but it took several weeks). I have not gone there since they switched to the new soup. They should be able to tell by my rewards card that I’ve stopped coming. Hopefully the powers that be will realize they made a mistake & will bring back the original soup. Sheri, ugh ugh ugh… what more can be said, right? Thanks for contacting Panera! Hi! I am also extremely disappointed in Paneras’ new soup and I am happy to see many others are too. Yesterday was my birthday and for dinner I bought their chicken noodle soup, not knowing they had changed their recipe. Their new soup completely ruined my birthday dinner, and none of my family members and I would eat it! I just finished emailing them about their new “soup.” (More like water with some squishy chicken, stubby noodles, and a few dashes of parsley.) Hopefully they’ll change it back, because if they don’t, I know they’ll loose at least one loyal customer! Haley, your description of the new soup is hilarious… and unfortunately SPOT ON… thanks for the comment! Yes!!!! More people who hate the soup!!!!!!! I have emailed them already a couple of weeks ago after getting a bowl of this chicken water. Why would you go from a great creamy, fluffy noodled soup to something that tastes like a 99 cent can of crap. A friend of mine works for the VP of marketing so I told her to make sure she tells him I hate the soup. Sherry! I couldn’t agree with you more! Thanks for the comment!! The noodles used to taste homemade, and the soup was very creamy for being low-fat. WHAT HAPPENED? This new soup tastes worse than cheap canned soup. What until you see what the new soup does to a bread bowl…it’s so watery and liquidy that it turn your bread bowl to a disgusting mush. YUCK! I found this post when I googled about the change in the soup recipe. What a disappointment! Maybe with more people dropping a note to headquarters they will go back to old formula. I haven’t been back to Panera since…. Ms. O, thank you for your comment! Wow! I was so happy to find this website. 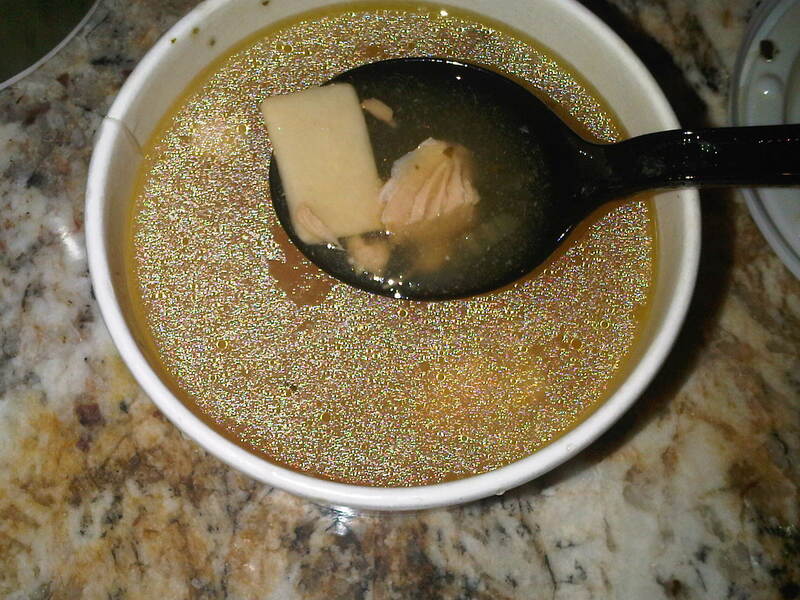 I ordered the new chicken noodle soup on the very first day my panera started to serve it, and it was AWFUL! I wront an e-mail that same day complaining, and got the same responce as everyone else. Do we know if they are considering changing this back? I used to go to Panrea about 2-3 times per week, and all I would order would be a soda and soup. I have not been there ONCE since the soup changed. I hope they decide to change back the soup, because it was the only healty “fast food” option I could find, and it was delicious! Thanks Molly, sounds like a lot of us feel the same way… ugh… glad you contacted them! I will post anything I hear back, keep your fingers crossed! Thank you for the comment! I got the new soup a few weeks back and thought it must’ve been a mistake. Apparently not, because when I went today, I was again severely disappointed in the soup. I was really happy when I found this post so I could confirm that they changed the recipe. Reading the letter from the founder on their facebook page made me laughed. Four years spent making the soup!? Seriously? Have they even tasted it? Anyway, I sent a very angry message to their customer service, and I’m hoping that they’ll bring back the old soup. If not, I’m not wasting almost $5 on a glorified bowl of salt. Hey Ashley! Ha ha… I haven’t been to their FB page in some time…. 4 YEARS making the soup, hee hee…. For some reason that cracks me up, if it’s true I never would have admitted to it if I were them, ugh! Yes, salty water it is! What do all the chefs say? YOU HAVE TO TASTE IT!! Yep, almost $5… Ugh, glad you were able to express your feelings to Panera… And THANKS for commenting! I also sent a note to Panera regarding my distaste for the change in Chicken Noodle, however, I got no response. It’s the main reason I used to go there…so now they’ve lost a customer completely. Thanks for the comment Megan. I know it took quite a while for me to get a response from them, so maybe you will too? If it’s like my response it’s more of a form letter stating how wonderful the soup is… and healthy, with almost a days worth of sodium… maybe we can get Dr. Oz to comment, hee hee… I’m on a quest to find a good chicken noodle soup that tastes similar with those wonderful noodles… no luck so far, but if I do, I will post it here! I just wanted to voice my opinion about the ‘newish’ chicken noodle soup as I know it’s been around for a couple of months. This is really disgusting compared to the previous one. The broth is thin and the noodles are really terrible. The old noodles were fluffy and the soup tasted a lot better overall and very homemade tasting. I will switch to something different from now on and I am sad that I chose this today as I was really looking forward to it. I usually get the chicken and wild rice on Thursdays, but wasn’t feeling so well and picked the “good old chicken noodle” because it’s always been soothing and reminded me of home. Not anymore. It’s worse than canned soup – I could make better at home. Sorry for the complaint, but I think you should hear from the people…in this economy, you can’t afford to lose people for simple things. EXCELLENT comment Laurie… you hit the nail on the head… in this economy paying $4 for a bowl of soup that is worse than the cheapest canned soup doesn’t sit well with most people… they can’t make a soup just to make the calorie numbers on their menu boards look good… it’s GOT to taste good as well! This one just doesn’t measure up… Thanks for the comment! Totally agree, as you can see in the picture… oil slick… and full of sodium… ugh. Ron… WHOA! Awesome facts! 900% more sugars?!! That’s what’s making America on the heavy side… ugh. Yes, you can tell it’s not “healthy”, it’s just doesn’t taste good… but of course that’s only my opinion (well, and the rest of the people who comment)… Thanks for your insight! On the Panera website their chef proudly talks about how it is all natural, healthy, and that the new soup has 20% less sodium. While these statements may be true, I feel they are somewhat disingenuous. As it happens, I still have the nutritional analysis of the old soup available. For some odd reason the chef does not find it necessary to mention that the new soup has 25% more cholesterol, 900% more sugars, and 40% less protein when compared ounce for ounce with the old recipe. No joke. Care to share? I could add to my blogs about it here & here. I won’t stop until I get a coherent corporate response. Are you referring to the lovely new improved all natural full of salt but not full of chicken or vegetables panera soup image? If so, feel free… It’s what it looks like in real person and you have my permission to use my image… No problem! Keep me posted, keep up the great work! I really wish Panera would get the message. I love their salads and their chicken noodle soup was absolutely my favorite. I’ve looked for a similar recipe so many times, those noodles were perfect! I was blindsided as well a few months ago when I went to get it. I emailed them as well and got the same reply. What a disappointment, I hope they get the message and bring back the old one!! Me too Tracy!! Thanks for your comment! I emailed them several times about this and they eventually just started ignoring me. I asked if they could share the recipe since the product was now extinct and they told me no. The new version is just awful. Ugh… That’s frustrating… do you have a Boston Market near you? Stacey commented yesterday and mentioned that it was really good?? It’s my opinion that Panera isn’t handling this chicken soup thing very well (or for that matter any of the items that they create, gain a huge following for and then quit…). Thanks for your comment Allison! “I’m Dan Kish, Panera’s head chef. I want to update everyone on some new developments with our all-natural Chicken Noodle Soup. We are closely monitoring the conversations on this tab and all conversations on our Facebook page, as well as listening to what our guests are saying in our bakery-cafes. While we’re happy to know that many of you like the change in our soup, we do understand that some of you preferred our old recipe. We believe that continuing to provide great soups to our guests means remaining flexible and open to suggestions. While we remain committed to our new low-fat all-natural recipe that many of you have commented on, we wanted to act on the suggestions from many of you to make the Chicken Noodle Soup heartier with less broth and more noodles and carrots. WOOHOO is right! Thanks so much for this information! I will include it on a future post, and I will also give you credit for the good detective work! I was hoping if enough of us told them how we felt that they might listen… lets hope it gets much closer to the old recipe! This is a definite step in the right direction, so woohoo to Panera for listening! Molly, thanks so much for your comment!! Look for a shout out in a future post! Hey Molly, I haven’t forgotten you, I just haven’t made it back to Panera yet… have you tried the “new” soup? Is it comparable? Recently I was in there and the same person was back and when he saw me he said they were having another one to see who that works. It is heartier but the liquid is still thin. I can always bring my own cornstartch! haha! Hey Judy, thanks for the update! I haven’t been in Panera in so long, will have go check it out!! Great news… Heartier sounds better…! Thanks again! they may be changing it, but now i’m scared to buy the soup because I don’t want to buy it and STILL have it taste like crap! I agree. The new soup tastes like something out of a can. The broth is watery and lacks the flavor of the old soup. I used to go to Panera just for the chicken noodle soup, but now I’ve been ordering other things because I’ve been so disappointed with what was once my favorite item on their menu. We stopped at Panera and they had a new soup, lemon chicken orzo… It was AWESOME!!! If they have it in your area, and it sounds good to you, give it a try! Thanks for your comment! i agree, i didnt realize they had changed their soup either. i purchased it this past month (i guess im a little late haha) and suddenly realized that the base was now entirely broth which isnt a bad thing but it lacked all the flavor and intensity richness with the ‘creamier’ base. i am completely disappointed in this healthier version. i guess ill have to go to the chicken and rice soup unless they decide to change that as well! Bummer the good soup is gone… the soup you tried I believe is the REVISED healthy soup (healthy is a term used loosely as it contains 1380mg sodium in one serving! ), the cream of chicken and wild rice has almost three times the calories and 17g fat (8 saturated)… but it probably has taste, I haven’t tried it… I DID try the lemon chicken and rice soup, it was great, then they removed it from the menu, sigh… haven’t been back… Thanks for commenting Janeen! I agree with you! I loved the old soup and this new stuff just does not do it for me. I wrote them as well. I hope they change it back!! I could really go for a cup of the original soup with those wonderful noodles right now! Sigh… Great that you let them know! Thanks for your comment Liz! Try their chicken stew. It was delicious! Hey Barb! Thanks for the comment… haven’t been there in quite a while, so I didn’t realize they had chicken stew, will give it a try! Appreciate it! I used to eat there all the time with my friend but I haven’t been back since they changed their chicken noodle soup. It’s been well over a year now. I tried complaining then, but to no avail! I used to pay around $17 for a quart of that stuff and was happy to do so. All I can say about the new version is that if I wanted Campbell’s or Progresso quality I could get that at the supermarket for a lot cheaper! BAD move, Panera!!!! I couldn’t have possibly said it better myself. I feel exactly the same way… I have tried a lemon CHX soup offered at one point this year, but it was only for a short time, nothing too great, but better than the current CHX noodle soup, so since there isn’t anything that appeals to me I have moved on…. I did hear a comment from someone that the CHX stew was good, but I just haven’t been back… Thanks for your comment Georgia! I LOVE the current chicken noodle soup at Panera Bread!! I never had the old one, but the current one is so broth-y and delicious. I lovebrothel most clear – not creamy – broth, the white meat chicken, and the noodles & veggies in it. So so yummy! I wish I could find such a simple chicken noodle soup in more places. Thanks for your comment Amanda, great news for those who like brothy soup! Enjoy! Maybe Panera has changed its recipe! I recently had their low-fat chicken noodle soup and thought it was the best I have ever eaten, and I have tried it many, many places. The broth was like no other broth I have ever had. It was so good that yesterday I got my husband to go back to the same place (25-30 miles away, although two other Paneras are very close to us!) to make sure it was like what I had last week. Thanks for commenting Dixie! Next time it gets chilly here I’ll have to give that soup a try, I haven’t been to Panera in quite some time, thanks for passing on the information! I just came across your thread here and I too was a devout Panera Chicken Noodle Soup fan! My husband and I used to go there at least twice a week, usually three times. Over time some of the items we ordered changed (they changed their balsamic dressing to include eggs, which I am allergic to, without notice. I had a reaction (hives). I started to bring my OWN balsamic dressing to lunch. They changed their chicken from pepper chicken to include citrus, again without notice, again more hives. So I switched to turkey sandwiches). The LAST straw for me was them changing their Chicken Noodle Soup! I was sooo disappointed. I heard that the new soup is cheaper to make and that is why they switched. Now I’m pregnant (in my first trimester) and am feeling sick all the time and all I want is the old soup! Maybe I’ll pop in and ask for a sample of the soup just to see how it is, but I’m scared if it is gross (in my current delicate state) I’ll upchuck right in the middle of the store! LOL! Whoa… frustrating that ingredients keep changing… especially when you have food allergies. Although, I think this is common… Ugh, I would be leery to try a new soup while you’re pregnant… be sure to ask for the list of ingredients, I think they have a book?! Check online as well! Hope all is well and CONGRATULATIONS, you are too funny! Panera should be serving a gourmet soup with the price they charge. That’s what the chicken noodle soup used to be like. Now they’re literally serving a Campbell’s equivalent for that big fat price. Nutrition is not why they changed their soup, it’s called making a larger profit. Panera can keep the dishwater with few carrots, celery and chicken pieces that they call chicken noodle. Truly pathetic. I couldn’t agree more… I found a wonderful chicken noodle soup to make… it makes a lot and you can freeze it! Worth the effort and healthier as well! I will post my version on my blog in the near future, but here’s the original recipe… I used manischewitz egg noodles (in ethnic section), they’re wonderful! Has Panera ever made a similar admission? Hey William! Thanks for commenting… make sure you contact Panera and let them know as well… I couldn’t agree more! Miss that old recipe, that soup was wonderful! I’ve been waiting and wishing for Panera to bring back this soup, and I’m glad to see that I’m not the only one. Just sent them an email! Thanks Dave! I feel the same way… there just wasn’t anything more comforting than that soup! Have a good day! Thank you for taking the time to contact Panera Bread. I apologize for the delay in response – our e-mail system only tracks submissions made through the form on our site (http://www.panerabread.com/about/contact/index2.php). Jeez, there’s nothing like a good form letter… really shows they’re listening to their customers… hmmm? Thanks for sharing! I know how you feel… I tried the ‘new’ soup a few times (with each variation), each one was not good to me… so enough, too many other places to eat! Thanks for commenting Carly! It’s nice to know that I’m not the only one. The old chicken soup was the stuff of legend. And why would you mess with a legend? Some folks like the new recipe, but I’m convinced those folks never had a chance to try the classic. The flavor, the balance, the heartiness, it was perfect. I especially loved it on a cold day or when I was under the weather. It was always a magic fix. It’s been years, but I can’t let it go. And I’ll never forget the sad day when they handed me the new stuff. No, no, no. I was polite, but I took it back and got a refund. I wonder if we could compromise. Maybe they could offer the new soup AND the original recipe. Options are always good, right? Then they make everybody happy. Yep it was good, especially if you were sick or cold, ha ha… No more soup at Panera for me… Matter of fact I just haven’t been in quite some time (don’t even remember the last time). Hopefully whatever recipe they ended up with is making their customers happy! I had Paneras chicken soup 2 days ago. It was 99 percent broth with only a couple of short square noodles and a few pieces of small chicken pieces sitting at the bottom of the bowl. I didn’t see ANY vegetables and the soup was bland. It looked just like the picture you have in displayed. It was very disappointing. I’m used to getting the potato soup so didn’t know what to expect. I just thought to myself that I wouldn’t be ordering this anymore. I had Panera Bread’s Chicken Noodle soup and guess what it tasted and LOOKED EXACTLY like…Campell’s Chunky Chicken Noodle Soup! Absolutely horrible! I guarantee you that if you try that canned stuff, you’ll see exactly what I’m talking about. Worst of all is that they have us believing that they’re giving FRESHLY-MADE soups! I’m so disappointed. Ugh, I haven’t heard anything about Panera’s soup in what seems like a few years. I would have hoped it would have gotten better. I haven’t had their soup in a very long time. I have gone occasionally for a salad. Thanks for the update Kelly! Hi, It’s Judy again. My husband and I still go, I usually get the Fuji apple salad and really like it. I started trying the soup again and I like it. The chicken is tender and in my opinion nothing like canned soup. You can tell the carrots are fresh, the broth is thicker but not from a thickener but from all the spices and noodles. I have to say I really liked it this time. So glad to hear Judy! Thanks for the tip!